In Three Tall Women, Edward Albee painted a brilliantly caustic portrait of a tyrannical old woman through the lens of three women at various points of life, illuminating the absurdist battle for survival. 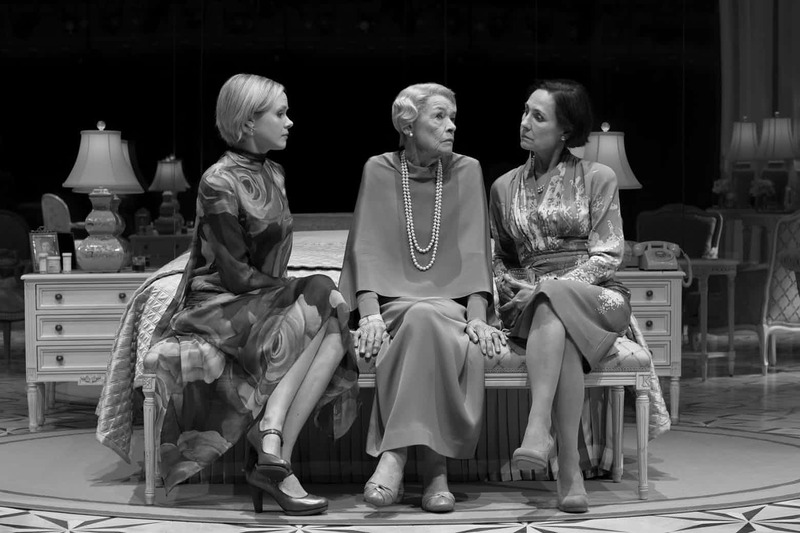 These "three tall women" earned Albee his third Pulitzer Prize in 1994 and after his years in Broadway's shadow, they revived his place on a top rung of dmerican theater. The work is a masterpiece, performed by a masterful trifecta, Glenda Jackson, Laurie Metcalf, and Alison Pill and directed by a master of his craft, Joe Mantello (The Humans). Albee (Who's Afraid of Virginia Woolf?, A Delicate Balance) was fiercely honest, acerbic, uncomfortably witty. He acknowledges the approach of death without sentimentality, communicating the pain and discomfort of one losing the fight with death, the things we forget and what we try to forget, the moments of darkness and light. It had to be written by the frankness of one who knows. That would be Mr. Albee. The aging woman played by Jackson was Albee's adoptive mother, a demanding dame, rich and high-hatted who made his life hell. Albee dove into the depths of her soul to exhume her life, and thus his own. He has described his play as "a kind of exorcism. And I didn’t end up any more fond of the woman after I finished it than when I started." Yet there is revealed a slender thread of forgiveness and a hint of atonement. This is a play with little action and a lot of talk and it is mesmerizing to watch. Albee's three woman are designated as separate characters in Act One. The dying woman, aged 92, played by Jackson, is just called "A", Metcalf ("B") is a middle-aged caretaker to a querulous taskmaster. "C" (Pill) portrays a young lawyer diligently trying to straiqhten out A's financial morass. In the comfort of plush elegance, A is peevish and indignant, prattling on, demanding and thankless. In the second act, without an intermission, the years slip back a decade. With smooth persuasion, Mantello directs a surprising turn in staging and conceit. The three actors all portray A at different ages. Jackson can glimpse the end of life when there is no longer hope or optimism. Metcalf has learned much of the game of life and is reconciled where it is headed. Pill at 26, is hopeful but learning fast. Like a funnel, Albee's view of life opens wide illuminated with promise but gradually narrows to a finite dark corridor with only one way out. Jackson is remarkable as the angry doyenne in Act One, railing against a body that turns against her and a mind she cannot control. After a 23-year absence from the stage, Jackson grabs energetically onto Albee's challenging emotional, intelligent dialogue. In Act One, living in the comfort of plush elegance, she is peevish and indignant, prattling on, demanding and thankless even as Metcalf is ready to help with rushes to the bathroom. Jackson rules the stage, stooped, unsteady, slipping into a final coma. In Act Two, ten years younger, Jackson is lighter, laughing at comic moments, remembering with astute timing and phrasing, who and what she was, the life she lived, the men she loved. Yet there is still that edge of nastiness. Metcalf is always focused, just this side of deadpan, playing the silences with the faintest expressions, a mid-life woman wrapped in bitterness and happy to warn C what is to come. Pill, in a less prominent role, has some meaty dialogue to make her own. She asks B, "..there is a lot of happiness along the way. Isn’t there!? And isn’t it always ahead? Aren’t I right?" Well-seasoned by the years, B replies, "Standing up here right on top of the middle of it has to be the happiest time. I mean, it’s the only time you get a three-hundred-and-sixty-degree view—see in all directions. Wow! What a view!" A, who might know best, steps in. "Coming to the end of it; yes. So. There it is. You asked, after all. That’s the happiest moment... When it’s all done. When we stop. When we can stop." And then there is the son who has no role but still appears as the center of his mother's disappointment. Mantello presents him with a subtlety leading to a power punch reminding us that the son has waged his revenge at his mother. He has had his exorcism. The production is exquisite with lush pale greens and yellows in Miriam Buether set, reflections of indulgence and luxury. She creates mirror miracles for Act Two, changing the immutable. It is theatricality you have to see and savor. Ann Roth designs elegant costumes for the women, gorgeous in Act Two in rich shades of lavender, each reflecting their ages and their eras. Paul Gallo's full house lighting in Act One is a harsh exposure of life's last days. An excellent Off-Broadway production in 1991, Three Tall Women starred Myra Carter (as A) and Marian Seldes (as B) and Jordan Baker (C). This production is the play's Broadway debut, a triumph for the late Edward Albee, for Joe Mantello and the welcome return of Glenda Jackson, authoritative Laurie Metcalf and skillful Alison Pill.